Take a large aluminum lasagna pan and line the bottom with charcoal. 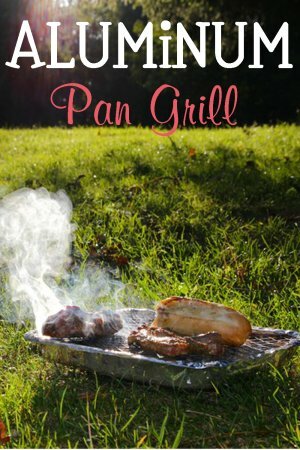 Light the charcoal then place a metal rack such as a cooling rack or small grilling rack on top of the pan. Once the charcoal is ready, add the meats and vegetables on the rack. Be sure to place the pan on concrete, sand or stones because the pan will get extremely hot. Not a good idea to do this in the grass like our picture shows!